It's been a fantastic year for independent game development. In the process of bringing together the shortlist for this year's Best Indie Game award, we've come to appreciate just how many diverse experiences smaller studios have provided - particularly when it comes to storytelling. Risk-taking developers have made headway into new methods of telling stories and considered fresh perspectives and more mature subjects. Also, there's a very good game where you sell slime poo. Impatient to get voting? Click here! Need a little more info on the nominees? Read on. The excitement for Game Grumps’ visual novel Dream Daddy demonstrated how much enthusiasm there is for games to tell new kinds of stories. While there’s a tongue-in-cheek (sometimes somebody else’s cheek) element to this tale of suburban dad dating, Dream Daddy has been made with sincerity and heart. While its romantic element is part of why it’s successful, this is also - crucially - a story about positive relationships between people who care about each other. In a medium that more often than not focuses on conflict, it’s easy to understand how refreshing that can be. Night in the Woods was a huge critical success for similar reasons. Despite the gorgeous abstract art style, this is a game about a town full of animal people where the emphasis is on ‘people’. There’s a Twin Peaks-ish mystery lurking at the game’s core, but the charm of Night in the Woods comes from the relative realism with which college dropout Mae and her friends are written. Touching on subjects like economic stagnation, depression and relationships, Night in the Woods gives players meaningful space to explore these subjects on their own terms. Best understood as an evolution of the ‘walking simulator’, Giant Sparrow’s extraordinary What Remains of Edith Finch packs a huge number of ideas into its three-hour running time. This is the story of a strange family in the Pacific northwest, whose incredible home forms a maze that you explore slowly over the course of play. The individual tragedies of each member of the Finch clan are told through touching, funny and inventive vignettes that retain their capacity to surprise all the way through to the end of the game. While the subjects that What Remains of Edith Finch touch upon are sad, this is a mature exploration of death that has room for heart and humour too. Tacoma is the next game by Fullbright, the studio that created formative walking sim Gone Home. Set on a trans-lunar space station in the near future, this is a believable and human story of life in space. 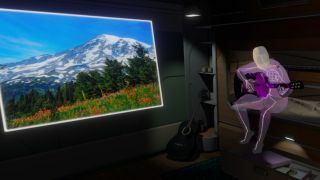 Tacoma’s most innovative features are its AR holograms - blocky silhouettes of the station’s former inhabitants who act out scenes from their lives around you as you explore. Pausing and rewinding these conversations, following specific characters and uncovering details about their lives is a compelling experience, blending ideas from immersive theatre with a degree of freedom that only games can offer. Another triumph of tale-telling, Stories Untold is a compilation of short sci-fi horror stories with linked themes but very different methods of presentation. You start off playing a text adventure on a beautifully-depicted old-school computer, before progressing to a lab, an arctic research station, and stranger places still. Although the VHS box set presentation echoes Stranger Things, Stories Untold is not a retro experience: its presentation, storytelling style and ambitious final twist are all very modern. Through Bastion, Transistor and now Pyre, Supergiant have made a name for themselves as a studio that is uniquely good at matching art to music, and music to game design. Pyre is no different. A fantasy sports game with depth and complexity, this is also a story-driven experience with an emphasis on character (and, yes, great music.) You’re asked to make lots of meaningful choices both on and off the field, and these decisions have a real impact on the course you chart through Pyre’s branching narrative. Thimbleweed Park wears its classic point-and-click adventure influences on its sleeve - but can you really call them ‘influences’ when this is the work of the man behind Maniac Mansion and Monkey Island? Ron Gilbert returns to the genre he helped to shape with a clever, accessible and most importantly funny mashup of classic 90s mystery TV tropes. A success on PC, Thimbleweed Park also proved that the Nintendo Switch is a perfect platform for point-and-click adventure on the move. Moving away from single player storytelling to anecdote-generating multiplayer, Friday the 13th is a very different sort of indie success. This asymmetric adaptation of the classic horror movie casts one player as Jason and the rest as terrified, mostly helpless camp counselors. Essentially a game of murderous hide-and-seek, Friday the 13th stands out for the way it generates both scary and hilarious horror stories by encouraging players to both worth together and screw each other over in pursuit of survival. Slime Rancher's charm and sense of fun also won lots of players over this year. It's a building, business and farming simulator with a heavy dose of exploration. You're a space rancher building up a collection of adorable bouncing slimes, each with its own needs and behaviour. These slimes 'produce' a valuable substance called plort, which you sell to fund your expansion into new areas. Plort is basically just slime poo, by the way. It's a game about farming slime poo. It's very good. The extraordinary, uncategorisable Everything is one of the most ambitious games in this year's shortlist. A vast simulation of the cosmos where the player becomes anything from a swirling galaxy to a spaceship to a regular ship to a bear to a hat, this is an exploratory meditation on the scale of the universe and life's place in it. There's little traditionally game-like about Everything: this is a sandbox and a science toy, and a showcase for the thoughts of the late philosopher Alan Watts. To vote for your indie game of the year, click here. You can also vote using our Facebook bot, if you prefer the personal touch. Don't forget to check your inbox after you've finished voting to claim a free ebook worth up to £15.99!